This the place to come to get information the Grant family in Southern Ireland. My Grants arrived in Kilkenney in 1169 and moved from there. I suggest you start with the Grant Family index page and work your way from there. 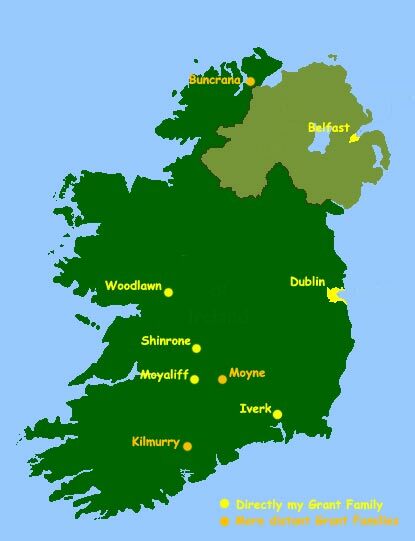 Alternatively click on the place you are interested in on the map of Ireland above. There is a fan chart showing the direct and indirect lines. Click on any individual for a write up on that individual. I have gone on to start a dna project to investigate the various branches of the Grants and how they are related. I started in 1966, to try to unearth the history of the Grant family in Ireland. Nothing was really known, certainly in our branch of the family, about who the Grants were or where they came from. Over the years more and more pieces of the jigsaw have been added to the story, so that it now stretches back to the Geraldines in Europe before the Norman invasion of England. It follows their progress via the Norman conquest of England to being among the first Normans to arrive in Ireland in 1170. We can follow the story through the middles ages from being Barons of Iverk in Kilkenny through being large landowners in Iverk (southern Kilkenny) until they were dispossessed by Cromwell in 1660. They then became flotsam on the sea of Irish history. They left Iverk when Cromwell dispossessed them. After that virtually every generation was forced to move on by war, famine or civil unrest. They lived in Co. Tipperary and Co. Offaly, with their numbers quickly expanding in the early 19th century when families of a dozen or more were the norm. The famine and the Land Wars in the second half of the 19th century finally spread the Grants far and wide, to Galway, to Dublin, England, the USA, Canada and Australia. Today there are more Grant families abroad than remaining in Co. Tipperary. The fortunes of the family can only really be understood in the context of Irish history. I have therefore given throughout a brief historical background to each chapter, so that the reader can see why they had to move or emigrate when they did. A family history is much more than just names on a genealogy tree. So I have set out to weave the Grant story into the historical events that were taking place around them.